Part I. Standing Up for Families: 1. 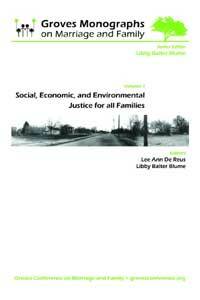 Seeking Social Justice for Families, Lee Ann De Reus; 2. Call to Action: Five Policy Proposals on Behalf of Families, Leslie A. Koepke; 3. Teaching about Marriage Inequality: A Classroom Simulation, Ramona Faith Oswald; 4. Social Justice for Mexican American Elderly: Family Protective Factors and Life Satisfaction, Merranda Romero Marin & Charles H. Huber; 5. Coping with Injustice: A Developmental Model, Gary Horlacher & Ernest Horstmanshoff. Part II. Speaking Out for Justice: 6. Re-spiriting the City: Grassroots Activists and Social Justice Struggles in Detroit, E. Prasad Venugopal; 7. Social Justice Theatre: Malice Aforethought: The Sweet Trials, Arthur J. Beer & Libby Balter Blume; 8. Constructive Work with Urban Gangs, Carl S. Taylor & Pamela R. Smith; 9. Promoting a Socially Just Campus Climate, Susan M. Wolfgram & Hollace Anne Teuber; 10. Engaging, Claiming, and Changing White Privilege: Educational Practices for Teaching and Learning about Intersectionalities, Katherine R. Allen & Sally A. Lloyd.